1944. Paul Brandt, a soldier in the German army, returns wounded and ashamed from the bloody chaos of the Eastern front to find his village home much changed and existing in the dark shadow of an SS rest hut - a luxurious retreat for those who manage the concentration camps, run with the help of a small group of female prisoners who - against all odds - have so far survived the war. But as the Russian offensive moves ever closer, the days of this rest hut and its SS inhabitants are numbered. And while hope - for Brandt and the female prisoners - grows tantalizingly close, the danger too is now greater than ever. Well. Wow. I’m not sure where to begin. This book took my breath away. I expected the faultless, gorgeous writing before I even opened the book. William Ryan hasn’t let me down in that respect yet. The fact that the story gripped me from the start and didn’t let me go, even when I wasn’t reading, didn’t come as a surprise either. But I think the author surpassed himself here. 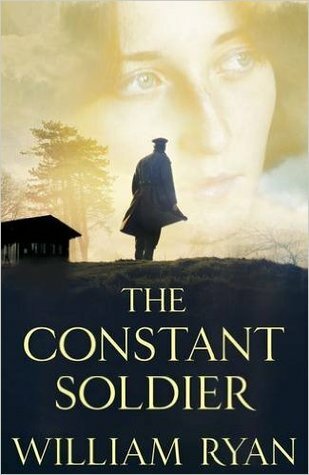 As much as I admired and adored the Captain Alexei Korolev stories (and wouldn’t mind seeing more of them), The Constant Soldier hit me harder and will stay with me for much longer. This book is almost deceptive. It appears to be a quiet, inwards looking tale about a man coming to terms to what has happened to him: his disfigurement, the loss of love, being forced to fight in a war he didn’t believe in while representing a regime he abhorred. The tension creeps up when he recognises the love he’d thought lost forever near his home, and manages to get a job at the SS rest hut where she’s forced to work. You worry about him and his desire to rescue her and the other women imprisoned there. You worry about the SS-er in command, who doesn’t appear too stable, and you really worry about Peichl who doesn’t think twice before shooting and killing those he sees only as expendable. And then the story switches to a different perspective. The Russians are coming. And you know that the second half of the book you’re reading is going to be a heartstopping adrenaline rush, a dilemma between wanting to rush ahead to see how it ends—doubting that it could possibly end well for all of those who deserve an escape from the violence—and savouring every word because they’re so very well written. This story is stunningly nuanced. Sure, we are introduced to more than one true monster and witness humanity at its worst. But we also get to see the other side. Those who were only victims, despite officially belonging to the ‘right’ side of the political status quo. And those who clung to their humanity with all their might, despite the odds being stacked against them, the world falling apart, and the fact that not being as cruel as those around them could easily put their own lives at risk. A few of the characters in this book are burdened with an overwhelming sense of guilt. Brandt carries a heavy burden of guilt about what has happened, what he has had to do, despite never having been a supporter of either the regime or the war, and more or less having been forced into military service as a result of his acts of resistance. This leads to him taking risks in an attempt to atone for what he perceives to be his gravest sin. For Neumann it means hallucinations and an ever increasing sense of hopelessness. These two men, more than any of the other characters in this book, show us what is so very easy to forget when we think about the second World War; not every soldier was a blood thirsty monster. Many just got caught up in the madness and tried to stay alive while doing as little harm as they possibly could in the process. This doesn’t mean that the author tried to make this period look less horrid than it was. The cruelty is always present in this book, sometimes in obvious, almost glaring ways, and at other times hidden under a thin veneer of studied civility. Because evil comes in many guises, from outright cruelty to just not caring, and wilful blindness. But the other side of evil is always present, if at times barely perceptible, portrayed by those who did what good they could in the face of odds stacked against them. While Brandt is the main protagonist in this story, it was the women who truly shone for me. The strength and determination of both the women prisoners and Polya, the Russian tank driver holding her own in a world of men and violence, was as glorious as it was through-provoking. It did make me wonder whether or not I’d be able, whether or not I’d find that strength within me when faced with impossible odds. And I can’t help hoping this is a question I’ll never have to answer. The writing in this book is excellent, stunning even, causing me to stop reading occasionally, just to appreciate the sentence or paragraph I’d just read. As dark as this story was at times—and how could it possibly have been anything else, given the subject matter—this is, ultimately a story about perseverance and hope, leaving the reader optimistic, despite the darkness that dominated so many of the pages. Long story short: This is a book for my extra-special list and I highly recommend it. You are very welcome, Ann. I hope you'll enjoy it as much as I did.